Management at eight Walmart stores in the DC metropolitan area acted quickly to squash leafleting to support striking workers. 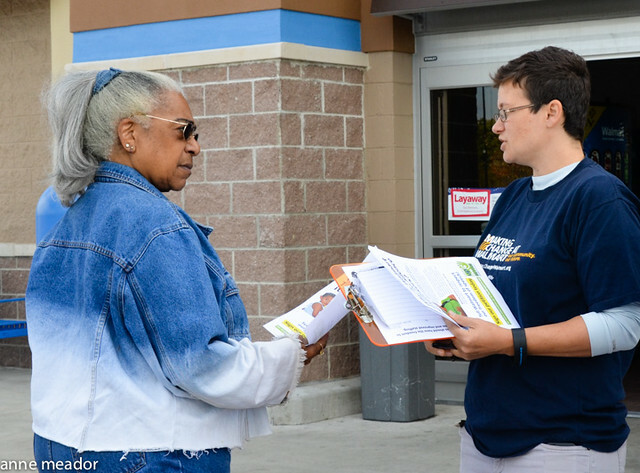 Activists from a coalition of local organizations visited Walmart stores in Alexandria, Germantown, Laurel, Bowie, Landover and Catonsville on October 10 to pass out fliers and petitions to customers and employees about the retailer’s alleged efforts to intimidate workers who seek improvements. In some instances, Walmart personnel called police to assist them off the property, although none intervened. On October 9, several Walmart workers in the DC metro area joined the first strike in the behemoth retailer’s history and walked off the job. Citing attempts to “silence and retaliate against workers for speaking out for improvements on the job,” the Making Change at Walmart campaign of the United Food & Commercial Workers (UFCW) conducted a national Day of Action on October 10 to support the strike. 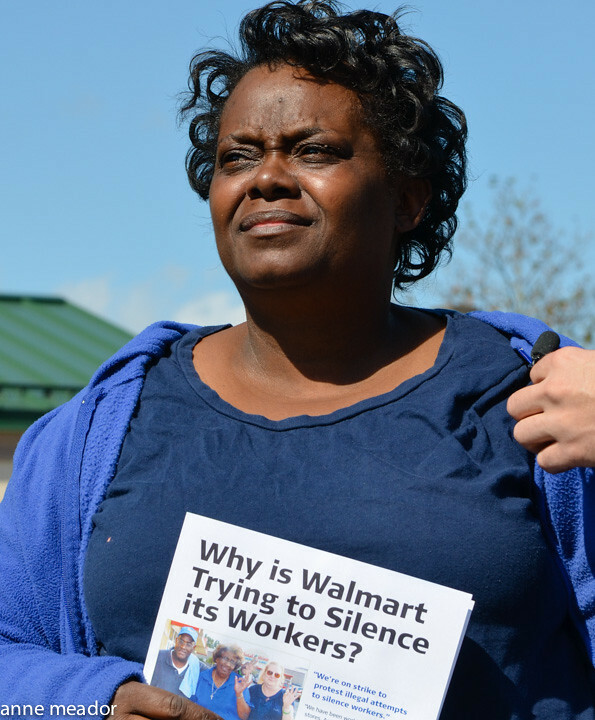 Eleven employees at the Walmart in Laurel, MD went on strike, and eight of them flew to Bentonville, Arkansas, home of Walmart’s corporate office, to join many others in airing their grievances. Foremost among them is the threat of retaliation for doing what they’re doing now–speaking up. The flier by OUR Walmart passed out at stores on Wednesday also emphasized strikers’ view that Walmart coerces them into keeping complaints to themselves. “The company is trying to silence and intimidate those who speak out through unfair disciplinary actions, cutbacks in hours and even firings,” it said. Members of various local groups, including DC Jobs with Justice, United Students Against Sweatshops, Ward Four Thrive and Respect DC, visited area stores and conversed with customers while handing out flyers. Walmart management, however, seemed to be on the lookout for strike supporters and had procedure in place to deal with them. One activist reported seeing a manager call in a “code” then rip flyers out of workers’ hands. Police were on site at the Capital Plaza store in Landover Hills, MD before any strike supporters even arrived. In one Alexandria store, a Walmart employee took passed-out flyers for the purpose of tearing them up. An assistant manager at the Laurel store declined to comment. In spite of Walmart management’s hostility toward them, organizer Mike Wilson of DC Jobs with Justice described their Walmart visits as successful. “We were able [to have] some really good conversations,” he said. Walmart is the world’s largest private employer with 1.4 million employees. It’s known for being aggressively anti-union and gone to great lengths to prevent its workforce from organizing, including a hotline for its managers to call. Only a few hundred workers nationwide have dared to walk out in the recent strike. Barbara Elliott felt she had to be one of them. “I’m here to represent those who are afraid to speak, to get the respect that we need,” she said. The DC-area strikers plan to return to work October 11.